This machine has a new external output terminal; its set of audio signal input terminals (LINE 5) is used to externally connect other preamplifier audio output terminals, so that this unit can be used as a stereo pure rear stage. A 203GS Class A amplifier represents the comprehensive performance of our company's experience in designing and manufacturing transistor power amplifiers for many years. It adopts the fully balanced amplifier circuit recognized by many international audio product manufacturers and enthusiasts to make the performance of sound quality, tone and sound field. The core of the preamplifier is a high-speed DC amplifier module chip developed with years of experience. It is characterized by wide frequency response, extremely low distortion, slim and thick sound, and dynamic and dynamic, surpassing many so-called audio ICs. And the sound quality of discrete components. The volume control adopts the electronic volume control chip CS3310 manufactured by American Crystal Company, so that the error level between channels is controlled within 0.5dB, which is much better than the ±3dB control precision of the quadruple mechanical potentiometer. A ring-shaped high-power transformer with a shielding box is placed inside the machine. The whole transformer is filled with epoxy resin, which effectively reduces the vibration and noise interference generated by the transformer. The two channels use audio-specific filter capacitors with a total capacity of up to 120,000 microfarads. 32 high-power transistors form a 100W class A output stage, and the sound performance is in addition to the delicate and thick, but also the strength of the mountain. In order to match the performance of this machine, MKP audio special film non-polar capacitor, 1% high precision metal film resistor, parallel regulated power supply. The post-stage signal input circuit is composed of a FET composed of cascode differential amplification, and the famous transistor is used for the second-stage differential voltage amplification and current drive. A 203GS introduces CPU full-featured control and data information screen display mode, which makes HIFI power amplifier enter the epoch-making digital technology field. In order to make the fans more convenient to use this machine, the infrared full-function remote control system is set to realize the full data. The manipulation effect of human-machine dialogue on information exchange. The design of the A 203GS amplifier is designed to reflect the main purpose of the product. 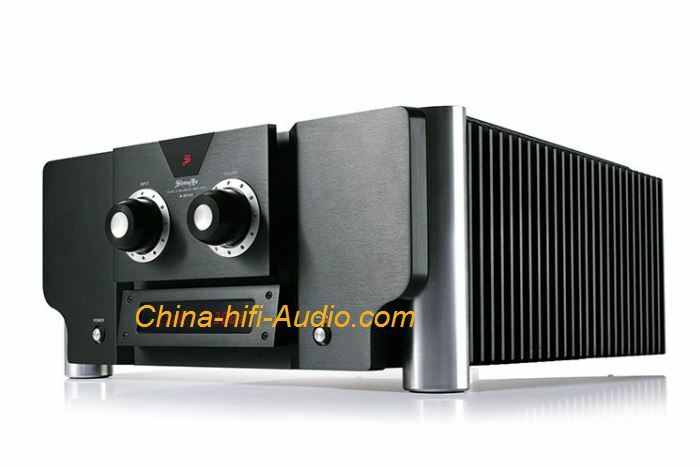 It has abandoned the monotonous and rough style of the American high-power amplifier, and adopts the interaction between the overall shape and the detailed characterization, so that it has the power symbol of the latter stage. The control charm of the pre-stage solves the problem of the post-stage rigidity of the high-power merger machine. The details are rich and elegant, and every detail is derived from the inside out, from the big to the small, naturally wonderful and without artificial. In today's world of silver-loaded machines, boldly adopting black and decorating it with a small amount of aluminum-colored natural parts not only enhances the visual impact, but also makes the black charm, stability, domineering, and the relationship between the whole and the details is very exciting. Beautiful, very eye-catching, eternal in the temperament.